This workshop is about understanding the construction of a garment from two dimensional ‘flat’* pattern, to finished three dimensional ‘form’. ** Utilising the screen printed Make/Use T-shirt flat we will guide you through the creation of your own individualised T-shirt from the 48 different possible outcomes the pattern allows. 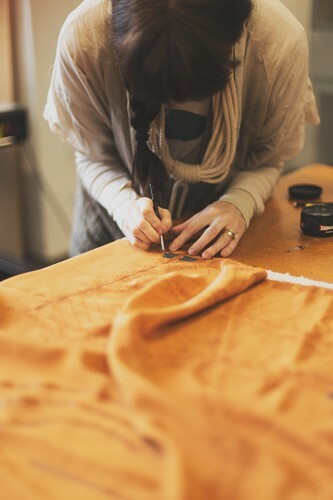 This process is unlike any traditional garment construction so no sewing experience is required. Morning and Afternoon tea will be provided, please bring your own lunch. $15 to cover cost of pre-printed Make/Use flat. of a garment are cut out and then sewn together. In zero waste fashion, there are no pieces to cut ‘out’ from the fabric, the whole fabric is used - it is the pattern. In Make/Use, we embed the pattern into the print of the fabric itself, or provide template ‘lines’ from which you can mark out your own pattern directly on the fabric. This fabric, once the pattern has been applied, is what we call a ‘flat’. **’form’: The ‘form’ is the term we use for a garment constructed from a ‘flat’.